George and the Dragon is the tale of a young knight who wishes to settle down and live a peaceful life, however upon returning to England, he finds England in a state of despair. The story mixes elements of ancient Christian legend of St. George and the Dragon with simplified "politically correct" version of Crusades and some modern-day New Age environmentalism thrown for good measure. The very simplicity of the characters and plot makes George and the Dragon one of few action spectacles suitable for the youngest audiences. Those who want more from films than simple stories can enjoy in some unusual performances from the relaxed actors who obviously had great deal of fun during the production. James Purefoy, British actor who was often talked about as potential James Bond, is very entertaining in his semi-comical portrayal of archetypal hero, while Patrick Swayze brings few unintended laughs in uncharacteristic role of villain. CGI dragon, on the other hand, leaves much to be desired, but this could be said about many other aspects of the film. 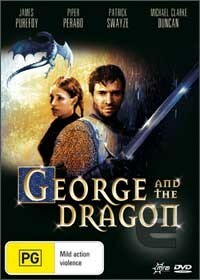 However, George and the Dragon may not be everyone's cup of tea is definitely a great family movie.